I had a real rough day as a mom a couple weeks ago. And I mean Rough... Each day brings it's own challenges, but this particular day was different. I was different. I decided to share this with you all, because this is real life as a mom. Things are most definitely not always perfect over at the Keenan house. I think it's important to take the bad days, learn from them, and hopefully do everything I can not to repeat them. It all started the night before... Liam was having a particularly rough night of sleep, and I was getting increasingly frustrated with each minute that he spent tossing & turning. I eventually hit my wall, and was no longer willing to nurse him. Conor took him for a bit that night (almost 2 hours actually) but nothing would calm Liam down for longer than a few minutes. He simply wanted Mama and wanted to nurse. I couldn't sleep during those two hours, because I could hear his cries throughout the house. Those heartbreaking whimpering in-between cries. Even though I knew that I could calm him down instantly, I just wasn't willing. I wasn't in a good place. I was more than frustrated with the current situation. I knew that I would feel horrible about it later, but that didn't change how I felt in the moment. After two hours of his persistent crying, I agreed to nurse him again so we could all get back to sleep. Liam fell asleep instantly, as did I. I was fully expecting to wake up in the morning and have the whole ordeal behind us, but that was just not the case. I woke up angry. Really angry. It was strange for me not to have slept off all the frustration, but there it was still lurking around me like a dark stormy cloud. I didn't like how I felt, but I couldn't change it and I knew Conor felt it and was growing frustrated unable to pull me out of it. It was as if I had completely lost my patience. Liam had obviously forgotten about the night before, and was his usual happy self the whole day. I was an absent mom most of the day. I put all my frustration into cleaning the house top to bottom, and then once again tried to sleep things off with a long afternoon nap when Conor and I just about hit a breaking point. I hardly spent time with Liam at all, and when I did I was just short with him. It puts a knot in my stomach just thinking about it. I knew that I would be so mad with myself once I came out of whatever funk I was in, that I would feel incredibly guilty, but that didn't change my actions that day. Without me even needing to ask, Conor gave me some space and took over all Liam duties. Looking back, I am so lucky to have such a caring husband & father. He was there for Liam in every single way that day. He was there in ways that I just wasn't able to be. Liam loved his day with just Daddy and that surely turned out to be my only saving grace. While Conor got Liam ready for bed that night, my mom sent a text to check in on me. I had talked to her earlier in the day and had let out much of my pent up frustration. My mom & I are as close as mother and daughter come, so I feel comfortable telling her everything. She always listens and knows the right things to say to comfort me without just giving me direction. I didn't want to nurse Liam to sleep that night, but I knew that would be the easiest way to get him down. I had my mom's loving words running through my head as Conor brought Liam to me. Liam gave me a hug & kiss as he crawled into bed, and I took in his freshly clean smell. That straight-out-of-the-bath-blonde-hair smell that immediately takes me back to his newborn days. His warm little body curled up on mine in that familiar way; and that night he just nestled right in. Nursing Liam to sleep that night changed everything. I let go of everything. I was his mama and he was my baby. Our love was something that could never break. In that moment all was right in the world again. I am so thankful for our nursing relationship, and that it continues to provide Liam & I with an extra close bond. Nursing was what brought me back to my self that night. It brought me back to Liam. I hope to never have a day like that again. In the least, I hope that I learned something as a mom, and that next time I won't allow myself to become that angry or that frustrated for so long. I spent the whole next day loving on Liam. The whole day was about him and growing our strong relationship. I know that he will never remember that terrible Sunday, and that both my boys love me unconditionally, no matter the challenge... And that, my friends, is the most amazing thing about being a Mom. Being a mom can be hard sometimes! Your mom sounds so much like my mom! When I'm having a rough day I talk to her and I think I've gotten a very similar text back from her at some point. It's good to have that calming influence in our life that reminds us they are just babies who don't realize how they push us to breaking points sometimes. I'm glad you got through that funk. So sorry to hear about how you were feeling. But we all have days like that too. Your moms text made me tear up! Glad all is well again! It's always comforting to know that you aren't the only mom who has a horrible day here or there. Thanks for your sweet comment. I'm pretty sure we have ALL been here! 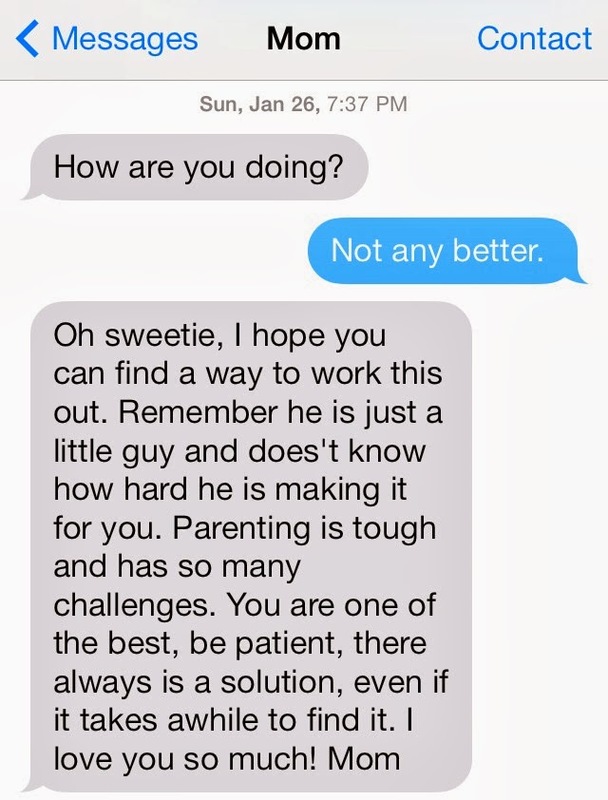 Things get difficult when your a parent, but everyone needs to work through it. Take it one day at a time and just keep moving forward. Such an honest post and I think something that all mom's experience. As a new mom I've definitely had a lot of frustrations. And I agree with you that it helps to have a partner who knows when to step in and offer some relief! Beautiful pictures! There are always some terrible days. And I think we need to accept them, because we are human. Sometimes it's just good to give oneself a break and not be a mom all the time. Then you can come back and have all the energy to be able to love your son even more. At least, that is what I think looking back at what it was like when my son was little. That picture is amazing. There are always terriable days but so many wonderful days. Parenting is the most rewarding thing I have ever done but it is also by far the hardest thing I have ever done too. It's so awesome that you're willing to be so honest in such a public way. Everyone has struggles but most of us feel uncomfortable sharing them with others and that just makes us all feel shame as if we were the only ones who have those types of struggles. I think we'd all be better off if we were more honest about the reality of our bad days/struggles. Oh, I've been there. I'm still there. We breastfed until my daughter was 3 and she crawls into bed with us every night shortly followed by her brother (we also co-slept with until she was 3 as well even though she had her own bed). The overwhelming urge to simply have my own space, my own sleep, my own... body. But then I realize how she isn't going to be so little for very long and the urge to cuddle with her one more night returns. Your honesty is beautiful. Every mom has their moments JUST LIKE THIS. Some more, some less.